It’s time for another installment of the Thrift Store Decor Upcycle Challenge! We think that this is probably the least expensive makeover/transformation we have ever done! 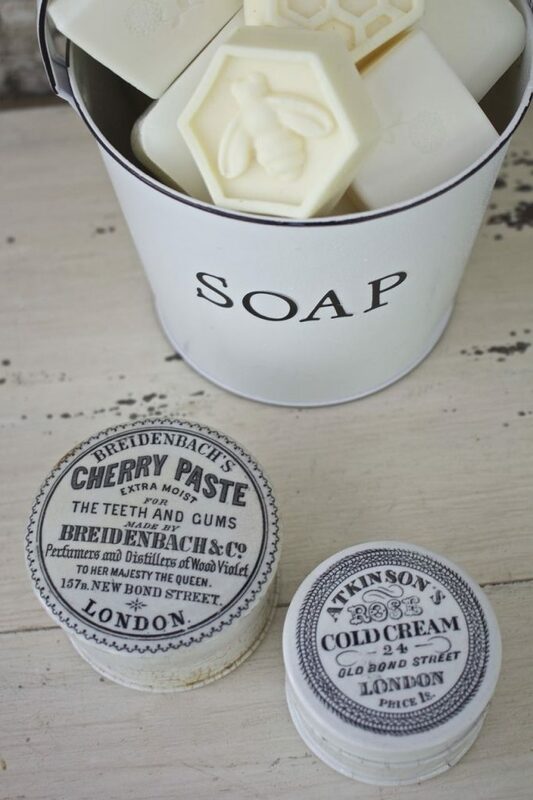 We created a faux enamel soap dish from an Easter pail! Once again we have teamed up with our talented blogger friends. You won’t believe the creativity this month – mind blowing! Being that the Easter holiday has just passed there were lots of donated items at the thrift store. 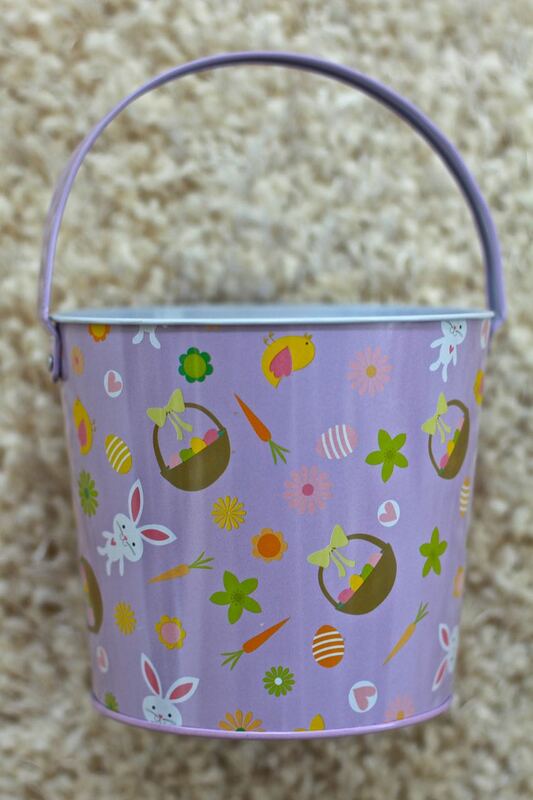 This sweet Easter pail was only .05 cents…that’s right, just a nickel. We think this must have originally been from a dollar store. 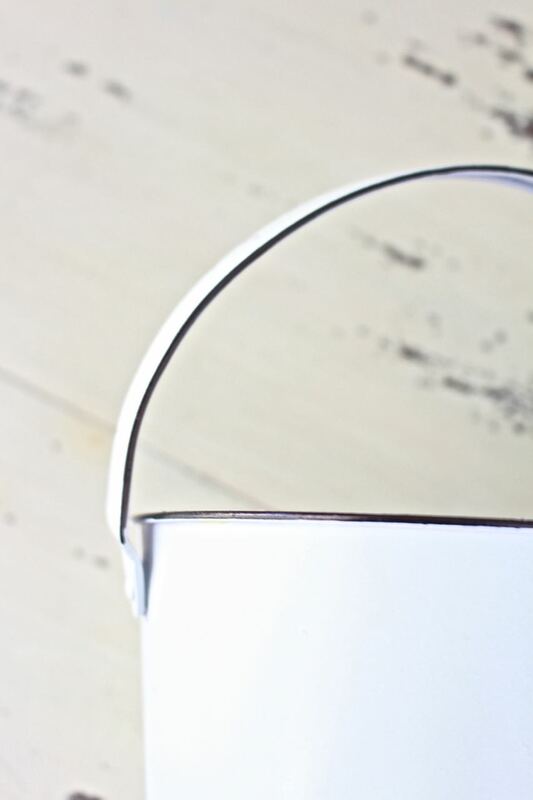 We immediately knew what we wanted to create when we saw this pail. Antique enamel and enamelware items are very pricey – but we knew that this was the perfect piece to try and recreate the look. 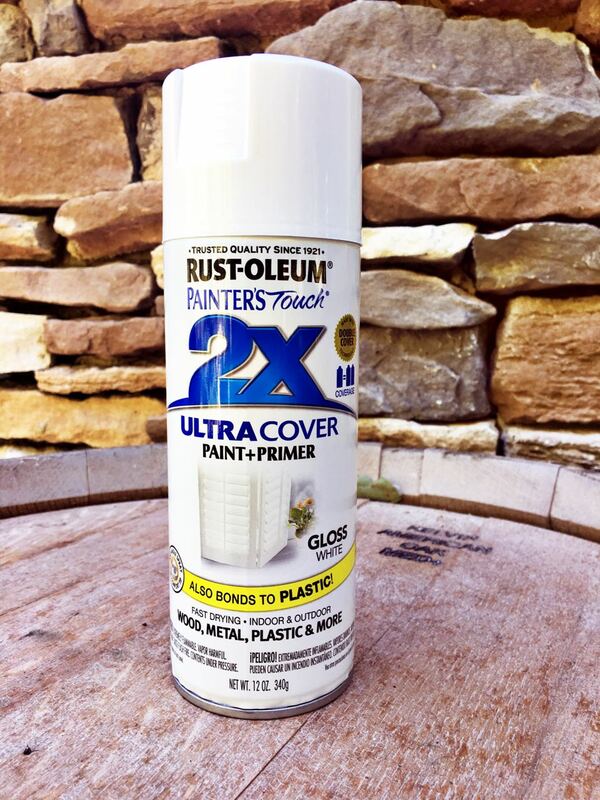 Using our favorite glossy white spray paint, we got to work. After just two light coats of spray paint, we achieved the look that we wanted. Remember when using spray paint it is best to use a light hand. You don’t want to end up with any drips or bubbles. Next, we decided that a black Sharpie marker was the best way to achieve the detail features of enamel. The black marker was applied to the handle and to the rim of the top and bottom of the pail. 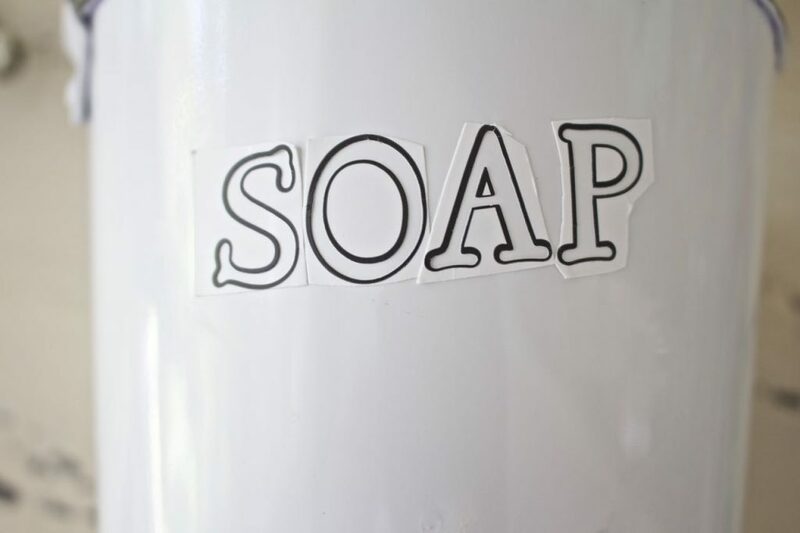 Next we used sticky-backed stencils to spell out “SOAP” on one side of the pail. Again we used our trusty Sharpie to fill in the letters. Extra care was used to not have any bleed-through on the letters. Look at how great this turned out! 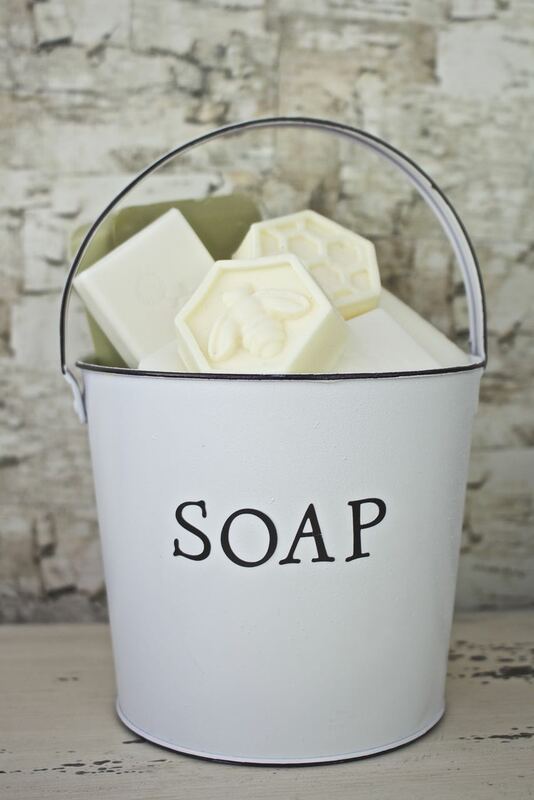 We filled the pail with our favorite soaps. 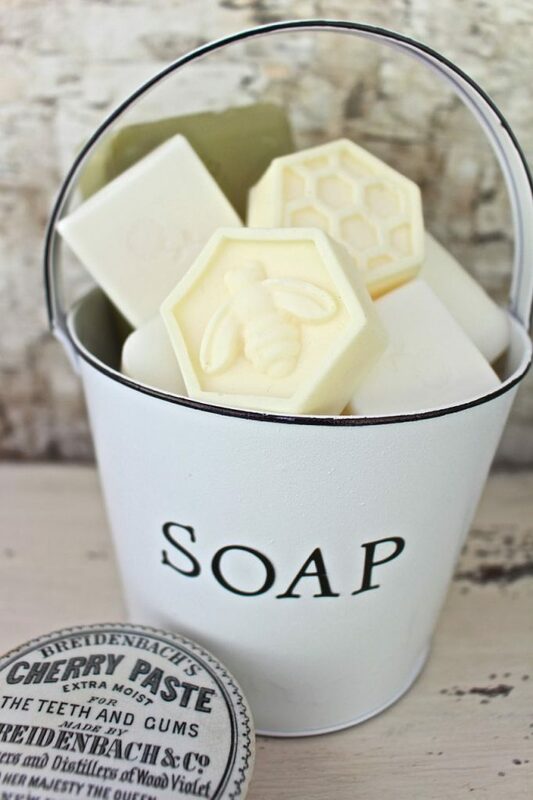 Do y’all remember when we made the scented bee soaps? We recently made a new batch to use as gifts. 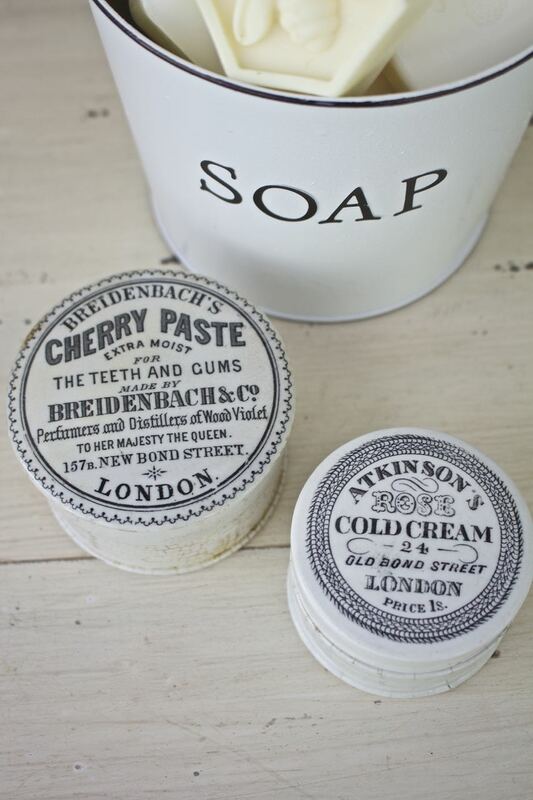 Vintage apothecary jars are a favorite collectible of ours. We were super fortunate to purchase these several years ago while in London on a special vacation. They were purchased in Notting Hill at the Portobello Market. The detailing on the lids is amazing! 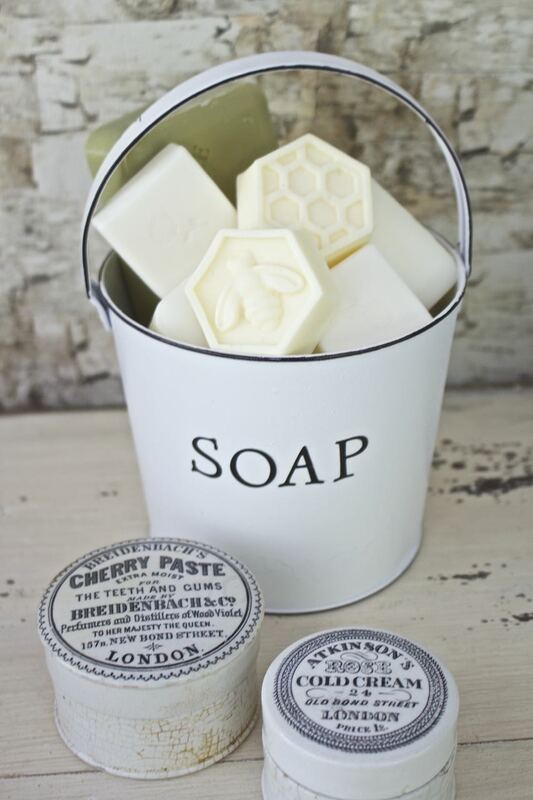 Our faux enamel soap dish will look great in the guest bathroom. Adorable! This I will be copying for sure! I have never seen sticky backed stencils before. I will have to be on the look-out for them! Love this idea! And that you made it with Sharpie (and not some fancy vinyl machine). 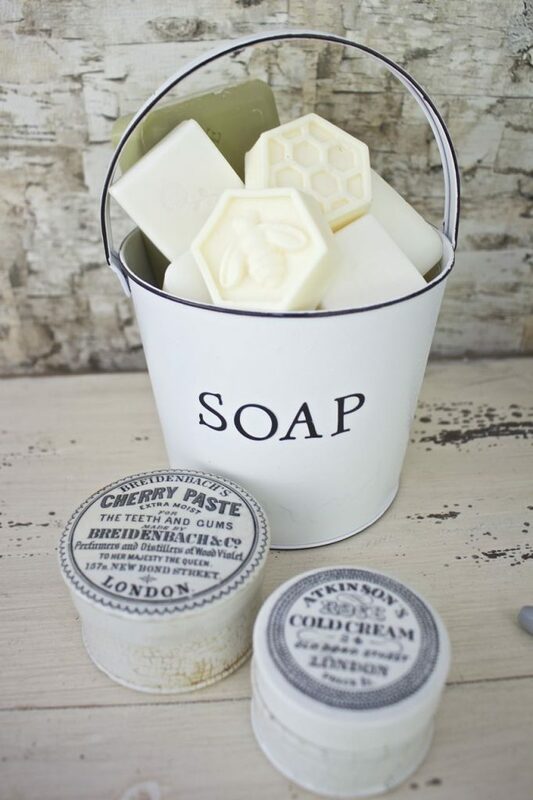 Great way to display pretty soaps. Visiting from Thrift Store Challenge. 2 words: mind blown! You have opened a whole new world to me. Thank you! This looks great! I can’t believe how real it looks. Pinned! Oh my gosh, this is so stinkin’ cute! I will look at metal buckets at the thrift store with new eyes! Love love love. Have a great weekend friends!! Wow! 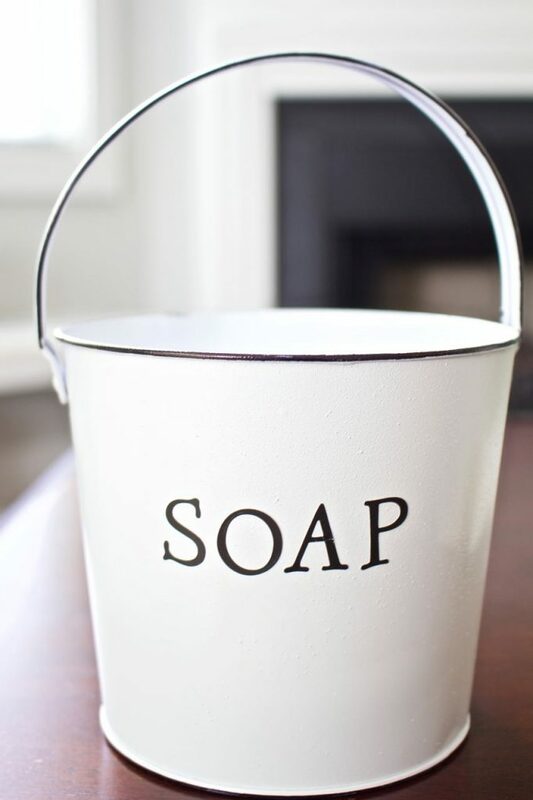 When I first saw the picture in the link I thought you had found the enamel pail and just added the word “soap” on it. I am amazed at the before and after. You guys did good! It is so simple and yet so brilliant! I have some small metal buckets that need a little help! Wow, wow, wow! I would have never thought that this was an Easter pail. Totally love the new look and I think I have a few of those that could use this makeover. I adore everything about this. What a fantastic idea. Brilliant use of sharpie. It looks perfect – so real. Wow, you did good. I love this idea and how easy to do. You are kidding me!?!? This looks absolutely adorable and I have so many little pails in my craft stash. Thanks for the inspiration. Love this. This looks fabulous! What a great deal at a nickle. =) I wouldn’t have ever thought of using a sharpie, but it worked great. JeanneeThat looks so legit! You two are very talented with that sharpie! I thought the bucket was vintage till I read the post! Nice!!!! sorry, the page jumped and placed my name at beginning rather than end….wish i could edit. Oh how adorable! I do believe I have a little bucket at home in my stash. I’m definitely going to have to make one. Oh. My. Gosh. This is amazing!! 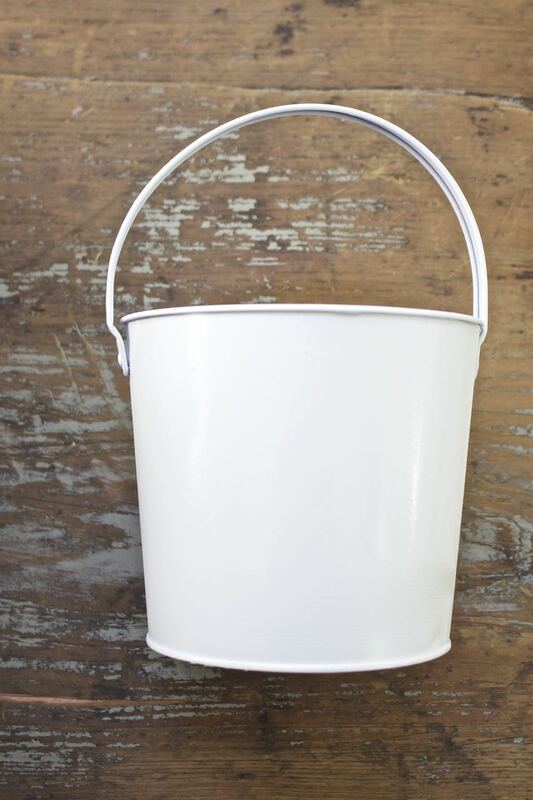 I am going to be tracking down all the random little buckets for our bathrooms now – seriously genius!! Wow, I can’t believe it is the same pail!! It seems a real enamel one!! I just think this is brilliant! I LOVE enamel, but it’s so pricey. This is a smart way to get the look for less. I would have never thought to turn this little pail into a soap dish!! So creative! I just love it & the little soaps are adorable! Oh this is adorable! I’ve got the perfect spot for this in our master bathroom. 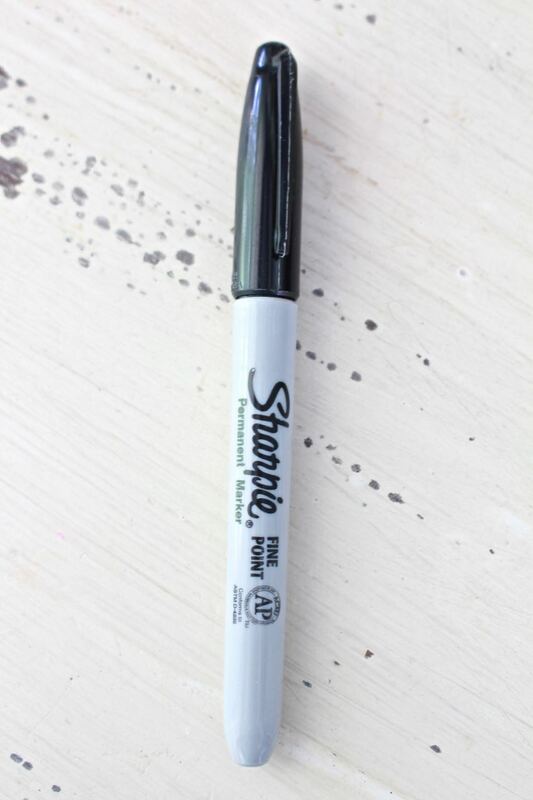 Awesome use of a black Sharpie!